A call to action: Defunding the arts defunds veterans. They fought for you. Fight for them. Budget Cuts began first as an art exhibition and informational night of art, storytelling, and conversation about our veterans and their connection to the arts. The conversation continues here as an online gathering of art, storytelling and conversation about our veterans and their connection to the arts. - Fund veterans needs before any further spending on war and defense. We cannot send our service members to war when we are not taking care of them when they return. - Save and expand the National Endowment for the Arts, which supports artists and programs that help our veterans. We stress to our elected officials that the federal budget must prioritize veterans’ services on at least an equal footing with any increase in defense and weapons systems spending. Additionally, our representatives must understand that when they defund arts and humanities programs (the NEA, the NEH, Community Development Block Grants) they are defunding organizations that work with veterans through the arts and art therapy as a means for dealing with wartime experiences and trauma. This funding comes through the federal budget to national and states organizations, and often its wider impact and influence cannot be measured in simply numbers. We hope to create a peacful space for awareness, conversation and connection. Images of the evening and gift baskets of art, writing and research created for our representatives and senators, which were hand delivered to their Fayetteville, Raleigh, and Wilmington offices. Jeremy Stainthorp Berggren: PTSD from Lynn Estomin on Vimeo. 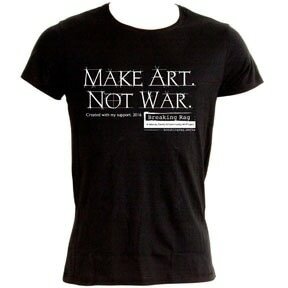 - vote against cuts to arts and humanities organizations in the proposed budget. Increase funding! Special thank you to Kirk deViere for attending! You can find information to include in a basket for your own local and state representatives here, and DOWNLOAD the BUDGET CUTS: Veterans & The Arts RESEARCH PACKET. You can find more ways to contact elected officials here through the Arts Action Center. Watch the videos and information available on this page and see the veteran artwork & writing exhibited to learn more and learn what you missed at the April 13th live Budget Cuts event. Budget Cuts Live was a evening of artwork, writing and research, hosted by veterans, about the connected between veterans and the arts. It was held on April 13, 2017 at Revolutionary Coworking, at 100 Hay St in Fayetteville. The conversation now continues on this site. Scroll down for more information. Below is work that was presented at Budget Cuts and included in gift baskets to the congressional leaders. Each image links to the original site to purchase the work directly from the creator. Below is access to the information and research presented at the live event. Invisible Wounds of War from UNCW Ofc of Univ Relations on Vimeo. - Interactive presentations and research on veteran arts organizations and active arts therapy programs. All research presented are linked on this site. Jen Johnson is the creator and director of Invisible Wounds of War project in Wilmington, NC. She is a photographer, writer and Licensed Professional Counselor in private practice. Jen is the former Statewide Coordinator for the Independent Living Needs Program at the VA in Georgia and the former manager of the Brain Injury Vocational Rehabilitation Program at Shepherd Center in Atlanta, GA.
- Open mic, open discussion, open hearts and open minds are welcome. Donations support ongoing efforts to continue the Budget Cuts: Veterans & The Arts advocacy work and Breaking Rag program. Artist, activist, teacher, and veteran Trish Brownlee began the Budget Cuts: Veterans & The Arts awareness campaign by first hosting an exhibit at Revolutionary Coworking on Thursday, April 13, 2017, focusing on the work of veteran artists, writers, performers, and more. The evening included discussion about how veterans benefit from art therapy and other arts practices, formal and grassroots, in the years following their service to our country. This presentation and exhibit was based on Trish's research during her MFA thesis and includes local and national working artists. The artwork and information presented is available on this site. Breaking Rag is working in partnership with Cape Fear Indivisible, Unitarian Universalist Congregation of Fayetteville and Revolutionary Coworking to support this important, needed and timely conversation here in Fayetteville. We are reaching out to our local, state, and federal representatives so that they may see the human face of the budget items that they will be voting on. 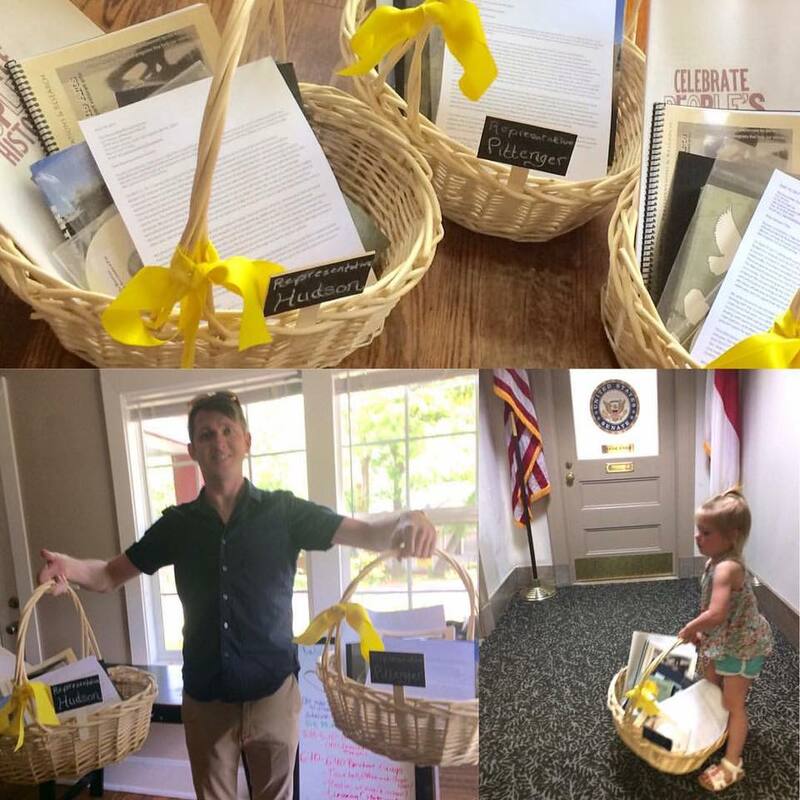 In addition to inviting them to the live event, we created four gift baskets with arts, writing and research from the exhibit for our senators and representatives, so that they may have this information and perspective as voting on the proposal federal budget begins in May, and hand-delivered them to offices in North Carolina. By participating, attending and supporting the Budget Cuts: Veterans & The Arts campaign, we hope to peacefully and honestly make our representatives hear our voices regarding the recently proposed federal budget. We are highlighting some of the ways in which this budget would impact the veteran and military populations within our community. We hope to bring awareness and shed light on the veteran-arts connection in all its forms.